If you would like others to know of a campaign for more allotments in your area, email us to put details on our website. Send brief details to allotmore@gmail.com, including a link to a campaign website or email address for others to make contact. A group of residents in North Wales started a campaign for allotments in Bodelwyddan, and submitted a petition to their local town council in 2009. Great news that in January 2010, the group was told at a council meeting that the bid to have allotments had been successful and that they could have the field in question at a 'peppercorn' rent. Oct 2010 - The fences are being erected around the site and one very kind local farmer has ploughed and rotavated all of the plots in one go. All that's left to do is mark out the individual plots are they're away. Email bodallotments@googlemail.com for more details. The Cowling Allotment Group are keen to work with their parish councilors to maintain the provision of well kept allotments in this steadily expanding Yorkshire village. Currently the village has a small number of allotments though demand is beginning to outweigh supply as more and more residents wish to embrace growing their own. They have a website http://cowlingallotmentgroup.blogspot.com which includes their contact email address CowlingAllotments@Gmail.com and would to hear from anyone in the village who would also like an allotment. A Campaign for more Allotments has been started by a working party of the Mid Sussex Friends of the Earth. An emerging plan for public use of land within the village of Quorn is now under severe threat of never seeing the light of day. A hectare of private allotment ground off Loughborough Road in Quorn has been identified by a developer who wishes to acquire the site and build luxury homes on it. The claim that the allotments are disused is partly due to the fact that agents for developers have gradually acquired a number of plots. Since these new owners are registered in the British Virgin Islands it is rather difficult to put those plots into use as allotments. "This is like the dog in the manger." Said Graham Stocks, Vice-Chairman of the Leicestershire Branch of the Campaign to Protect Rural England (CPRE). "It is to be hoped that the remaining owners of the freehold plots aren't seduced by financial offers from those wishing to build on the site." said Mr. Stocks. "I appeal to their consciences and so let them decide whether to hand on something of real and lasting value, not only to present residents but those in the future." He added. Fair land values and compensation would be decided by the District Valuer. "I can also see that the local authority might be seduced by generous financial rewards being awarded by the Government in their recently announced New Homes Bonus" said Mr. Stocks. "This is a target driven scheme to induce local authorities to accommodate as much new housing as possible. I sincerely hope this does not cloud Charnwood Borough Council's judgment in this particular planning matter." He added. 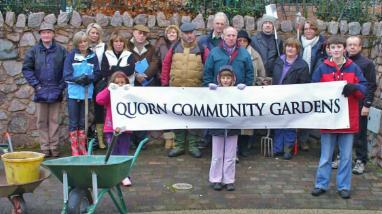 The Quorn Community Gardens project is seen as a highly sustainable use of public open space within the village envelope. It will be accessible to all and will not necessitate the use of car transport. It incorporates not just a large number of half-size allotment plots** but sensory and raised garden beds for those with disabilities; a community orchard; educational areas for the study of ecology and a buffer zone for the adjacent Tom Long's Meadow, a Site of Importance for Nature Conservation (SINC). * This fact was borne out by Charnwood BC's Green Spaces and Development Manager, on a recent visit to the allotment site. ** This will meet the demand for allotments in the village - currently there are approximately sixty people on the Quorn Parish Council allotment waiting list. The scheme will also accommodate garden plots for the two schools in the village and cub/scout/guide groups. February 2011 - A group is being set up in Livingston, West Lothian to campaign for additional allotment provision. There are currently only 21 plots in the town which has a population of 50,000. People interested in getting involved to campaign for additional allottment provision should contact Mark Thirgood by email mthirgood@gmail.com or by phone 07976 696905. There is an active campaign for more allotments on Wirral, which has presented several petitions and continues to lobby local councillors. Some of those on the waiting list have formed an Awaiting Allotment Society. This has become afiliated to the Wirral Federation of Allotment Societies (WFAS), which represents its interests to the council. A campaign has started to press Witheridge Parish Council to provide allotments for the residents of Witheridge in Devon, where currently there are no allotments. If you know of any land in Witheridge that could be used for allotments or would like an allotment there, you email rookley@tiscali.co.uk for more details.